PFR is equally as important as VPIP. In this article I will cover the PFR stat in the same way that I covered the VPIP (Voluntarily Put $ In Pot) stat. If you're not already familiar with VPIP, read my article on the poker VPIP stat first. Also, seeing as VPIP and PFR go hand in hand, I'll show you how they work together to help you understand what a common notation like 22/18 means (and why it's useful). PFR stands for Pre Flop Raise. 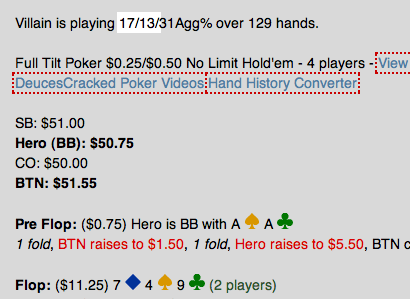 This stat shows the percentage of the time a player raises before the flop. Every time you make a preflop raise, it counts toward your PFR. This can be a simple raise to 4bbs, or it could be a 3bet or 4bet. Basically, any time you enter the pot preflop with a raise, you're contributing to your PFR stat. How to use PFR in Texas Hold'em. PFR on it's own has about as much use as the VPIP stat. Using PFR, you can get an idea of how tight or how loose a player is when raising before the flop. The bigger their PFR stat, the wider their range is when raising before the flop (and vice versa). PFR is far more useful when you compare it with a player's VPIP, and I'll go on to explain why in just a moment. What's the difference between VPIP and PFR? 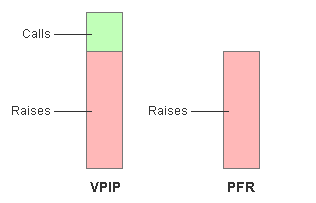 PFR is a more specific version of VPIP. VPIP tells you the percentage of the time a player either calls or raises preflop. PFR tells you the percentage of the time a player raises preflop. Therefore, when you look at a players VPIP and PFR side by side, their PFR will always be smaller (or equal to) their VPIP. Your VPIP includes all your preflop raises (PFR) in addition to any calls you might make. So the difference in percentage between the VPIP and PFR is made up from preflop calls. VPIP is simply PFR + calls. How to use VPIP and PFR. Example of how VPIP and PFR stats are used together in strategy threads on poker forums. VPIP and PFR go together like peanut butter and jelly, which is why you'll almost always see the stats side by side like 25/17 or 30/10. But why exactly is this helpful? If a large part of a player's VPIP is made up by their PFR, they are an aggressive player. Remember how I said that PFR is a portion of your VPIP? Well, that's important. If the vast majority of the time you enter a pot (VPIP) you are coming in for a raise (PFR), you are obviously an aggressive player (e.g. 25/22). Conversely, if your PFR only makes up a small part of your total VPIP, you are a weak/passive player that calls a lot more than you raise (e.g. 25/5). So whereas VPIP on it's own will tell you whether a player is tight or loose, their VPIP/PFR will tell you if they are passive or aggressive. Therefore, these two stats will give you a good idea of your opponent's playing style. This ratio of a players VPIP to PFR is also a decent indicator to the skill level of a poker player. Most fish will have a high ratio where their PFR is tiny in comparison to their VPIP, which means that they clearly don't have a great preflop strategy (because they are calling too much). To give you a rough idea, you ideally want to be raising at least 70% of the time you enter a pot. So if you have a VPIP of 20%, you wouldn't want to have a PFR of less than 14%. If your PFR is less than 70% of your VPIP, you're likely calling in spots where you should be raising. You should be more aggressive preflop. VPIP/PFR stats examples and player types. Mid VPIP, High PFR (e.g. 22/18). This is a tight aggressive player (a “TAG”). These are generally experienced players that have good preflop strategy and are likely to be decent post flop too. These tend to be the knowledgeable players that have an idea of what they're doing. High VPIP, low PFR (e.g. 34/5). This is a loose passive player (a “calling station”). These players call too often, which means that you can probably extract a lot of money from them through value betting when you have a decent hand. Don't try to bluff. Low VPIP, High PFR (e.g. 7/5). This is a super tight-aggressive player (a “nit” or “rock”). These players only play premium hands. These players should be easy to bluff, be but very wary when they start to show some action. High VPIP, High PFR (e.g. 40/35). This is a loose-aggressive player (a “maniac”). These players make wild bets and raises. They enjoy playing lots of hands and trying to win as many pots as possible. Just wait for a strong hand and keep calling. Examples of VPIP and PFR stats for different players when using a HUD during play. VPIP/PFR is by far the most potent combination of stats that you will come across in online poker. The PFR (Pre Flop Raise) stat is a decent stat on it's own, but it really comes in to its element with you compare it to the similar VPIP stat. This is why I covered how useful it is to combine the two in this guide, rather than dedicating the whole article to the PFR stat alone. Thanks to VPIP/PFR, you really start to get a picture of what a certain player is like when you can see the proportion of the time a player is raising when they actually enter a pot. Every HUD and a large portion of strategy threads use VPIP and PFR, so it's worth familiarising yourself with these stats early on.